If you are running a growing short-term rental business, you may have tried several times to run ads on Facebook. With the breadth of Facebook’s network, its international reach, and the possibilities to target people by demographic traits or by behavior, it can look very enticing. Yet, it is often very hard to make an actual return on the money invested in Facebook ad marketing or to get the kind of traffic that you want. How about looking over the shoulder of companies that have experienced online marketing departments, see what kind of ads they are running in your country and take inspiration from them? These companies have experimented and tried a lot of things, from the words they are using to the images they are showing, from the offer they are making to travelers to the way they try to convince homeowners to work with them. Instead of having yourself to go through this learning curve, how about looking at the Facebook ads that they are currently using, learn from them and adapt them to match your own Facebook marketing goals? This trick is all the better if you have already set up Facebook ad campaign for your rentalpreneur business. 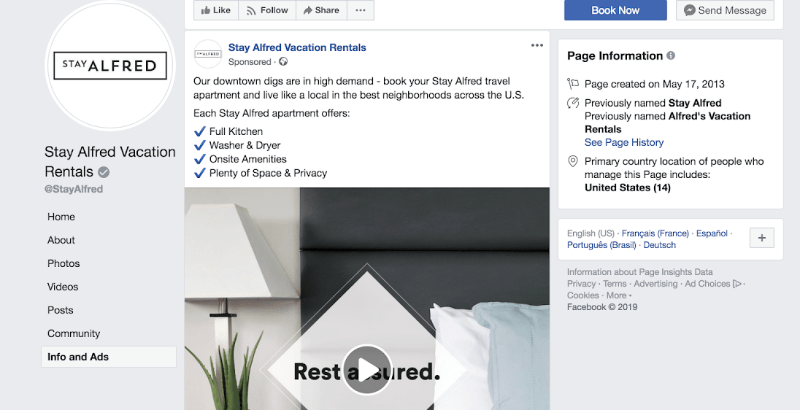 As a reminder, our friend Conrad O’Connel had shared with our community the basics to set up a first Facebook ad campaign in this article: Facebook Ad Goals Explained For Vacation Rentals. 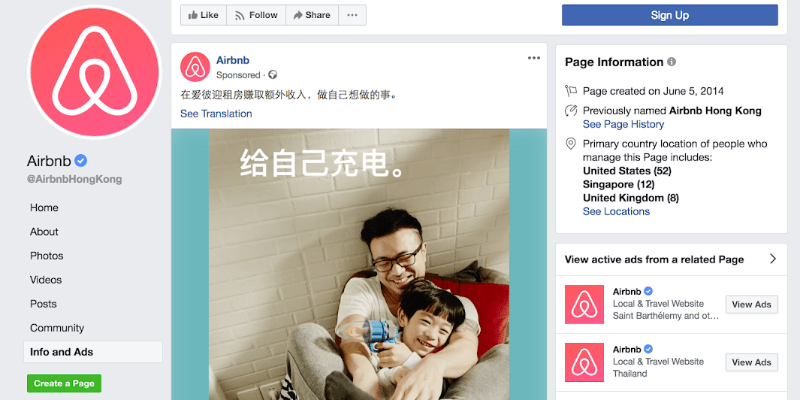 If you are more interested in getting back to your list of past guests or to people who have visited your website, then read Thibault Masson’s article about Facebook remarketing for vacation rental management companies. In the menu on the left side, click on Info and Ads (https://www.facebook.com/pg/StayAlfred/ads/). If you do not see this option, make sure to click on “See More“, as the Info and Ads choice may be hidden by default. You should now see the ads running for your default country. As Stay Alfred is a US-only company, you will see an empty page if you are not currently in the US. So, in the middle of the page, pick “United States” in the list of countries. This way, you can see which ads are running in a specific country of your choice. Looking at these ads, see what you can learn: What images are being used? What copy do they use in their text and on their image? Are they giving away some discount? Are they targeting a pain? Note that what you will NOT get here is the exact targeting used to display these campaigns: You do not know what demographic details are being used, you do not know whether this a campaign retargeting their website visitors, for instance. Yet, doing this little exercise can be informative and help you improve your campaign. If you are talking with your ad agency, it can also help you better discuss their proposal, so that the money that you are investing is used the best possible.